When we first moved into the garden, it was and overgrown blank canvas, rampant ivy covered the patio walls, carex grass and bamboo were out of control, buddleja was threatening the upstairs windows, ceanothus was battering the gutters and we caught the rhododendron in the middle of an invasion campaign. Immediately, even before the bathroom was unpacked, I set about to reclaim the garden and take back control, instilling some discipline into the overgrown plants, namely by cutting them down. 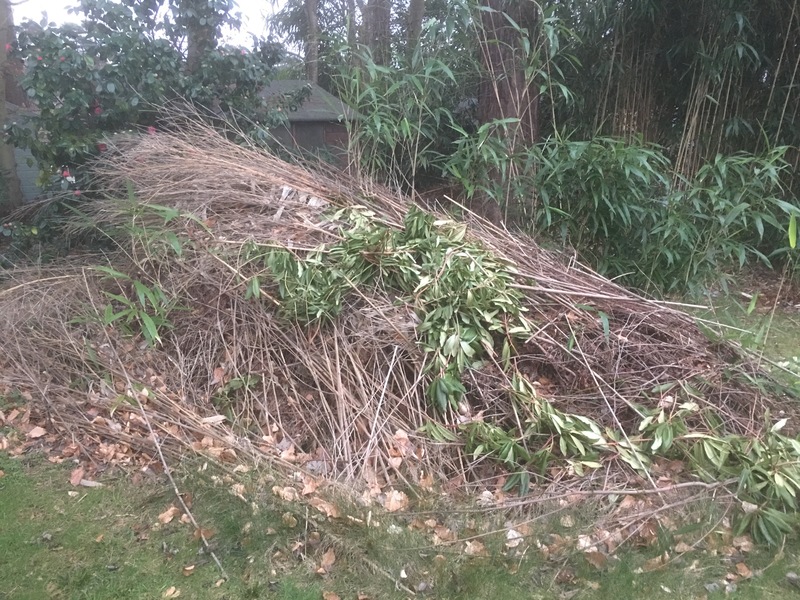 Discard piles and rubbish heaps appeared across the garden before the first borders were even drawn but they were gradually worked through a shredder and the mess made became a distant memory, as did those overgrown plants. There remained one mega-pile at the bottom of the garden, so large it was a high as the shed roof and almost as large as the previous garden we had just come from. Ignore the back-end of the cheeky deer, it’s the huge rubbish pile in front of the shed that keeps spoiling the view. For several years all the views towards the back of the garden featured this huge rubbish pile that just sat there and did, well, nothing. We kept our attention firmly focussed on the front-half of the back garden, creating, digging and planting the borders there, steadfastly ignoring the problem that just wouldn’t go away. 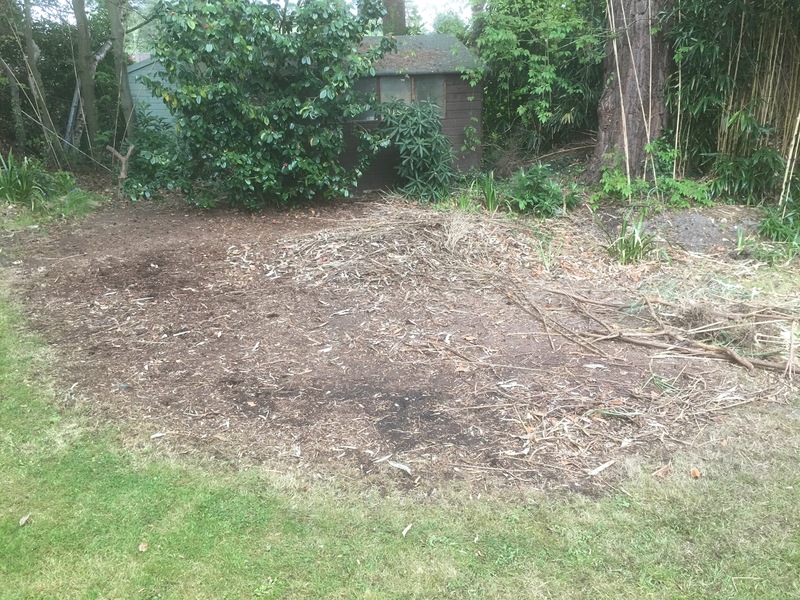 With Fruit Avenue, Magnolia Hill and the Exotic/Dahlia Borders now complete, the attention has shifted once again to the rear half of the garden and the rubbish pile that remains. Cue the shredder, incinerator, lawn mower and the full glare of my attention ready to impose its will over a Bank Holiday weekend of not-terrible weather. 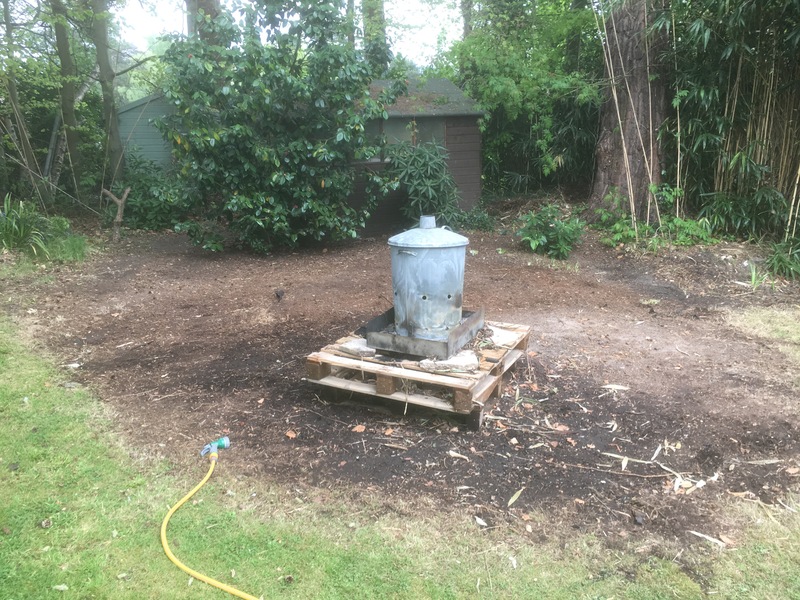 The shredder quickly gave up, unable to cope with the thick stems and branches of the wood, the incinerator took over and produced a hot smoke-less fire due to the “fuel” spending three years drying out. The lawnmower blended the dried leaves and smaller twigs, creating the most dreamy, friable leaf mode that is simply not available in the shops. The pile reduced as it was converted into ash and leaf-mould. The camellia was revealed, along with a part of the garden we hadn’t been able to step on almost since we moved in. The bamboo spreading into the middle of the mound has grown inwards from the right-hand side. 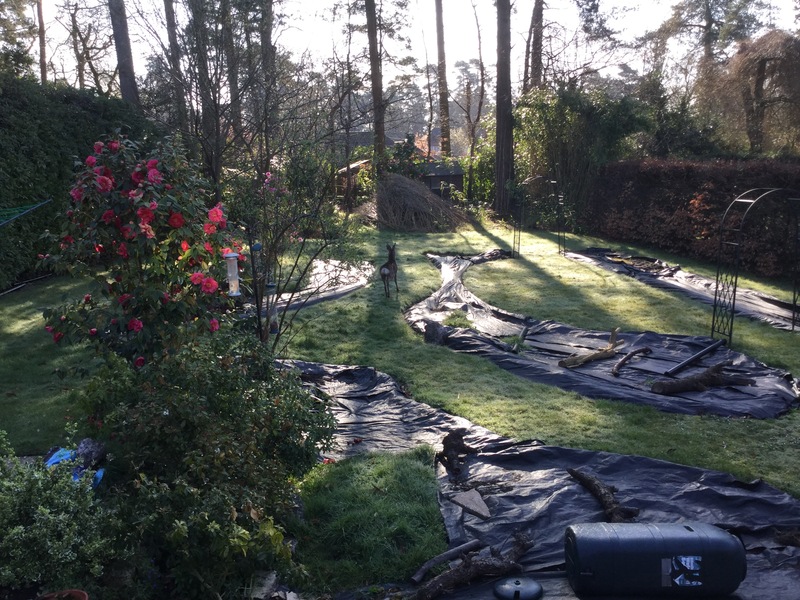 The whole area is covered with a weed control membrane with a thin layer of soil and grass over the top. This presents as much resistance to bamboo runners as wet tissue paper. I expect all the bamboo will have to come out. That might just re-create the rubbish pile we’ve been working so hard to get rid of. As the rear half of the garden is gradually cleared (the plan for 2017), the various nebulous ideas about what to do with it are starting to become a little clearer as I can “see” what might and might not work. Already I have ideas for a seating area in front of the camellia, with a border in front for some seclusion. The “join”, where the current “cultivated” garden ends the the “wild”, unplanned garden starts might be tricky to marry-up, I’m scared the borders will look disjointed, like building a row of terrace houses started from either end and ending up with a half-width that doesn’t line up in the middle. I’ll have to remember where I put my little scrap of paper that was the “master plan”, put another piece next to it and continue the border lines and see what I come up with. Wondered where you were…….. I can see what stopped you blogging for a while! I like bamboo, lovely sound in the wind, but some are very invasive. We have a miniature, yellow and green varigated, that is only 3ft high and has moved around 3 inches in 15 years! (Sorry). So you have one shed, or two? or is the green painted one in another garden? Anyway, looking forward to hearing all about this new area as you plan and plot! Hello Mrs. Mac, I’ve been away a bit as I’ve been ill, then I worked rather intensively in the garden clearing another space, then I went on holiday so I have a bit of catching up to do. I have two sheds but the painted one you can see in the picture belongs to the neighbour that backs onto us. 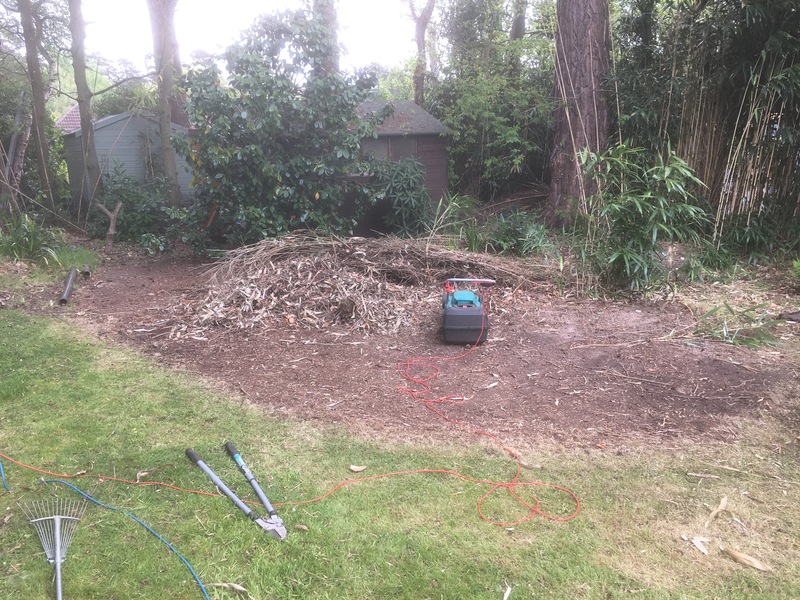 How satisfying to get rid of your big pile of debris, have useful by-products left over, and start thinking about the possibilities for your new section of back garden. I look forward to seeing it develop. Hello Jean, we’re glad to see it gone as it has been on my mind for a couple of years. I already have plans for what I want this area to feel like but it will be one time before I get round to making it a part of the garden proper. That was quite a job, must have been very satisfying. And now you have more space to play with! Hello Jason, it was quite a job to get rid of it because so much had accumulated. I can’t play with this space yet as I need it for temporary storage as I clear out other areas so it will be some time before I can start thinking about turning it into a new border.